Here is a recipe for some beautifully decorated festive healthy appetizer..
Veggie trays, move over! 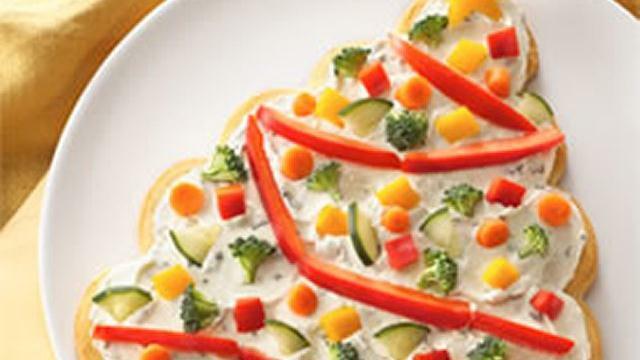 This colorful tree-shaped appetizer will add an interesting twist to your appetizer buffet. Heat oven to 375°F. Remove dough from cans in rolled sections; do not unroll. Cut each section into 8 slices (16 slices from each can). Place slices, cut side down, on ungreased cookie sheets to form trees. To form each tree, start by placing 1 slice for top; arrange 2 slices just below, with sides touching. Continue arranging row of 3 slices, then row of 4 slices, ending with row of 5 slices. Use remaining slice for trunk. Refrigerate one tree while the other bakes. Bake one tree 11 to 13 minutes or until golden brown. Cool 1 minute; carefully loosen with pancake turner and slide onto cooling rack to cool. Bake and cool second tree. Place each tree on serving platter. In small bowl, mix cream cheese, sour cream, dill and garlic powder; blend until smooth. Spread mixture over both trees. Decorate trees with assorted vegetable pieces. Refrigerate until serving time. To serve, pull apart slices of tree. Bake 13 to 15 minutes. Koda Kumi Confirms Her Pregnancy! What's On My Christmas List?